The introduction of new technology continues to broaden opportunities for people with disabilities to drive vehicles with hand controls and adaptive automotive products and devices. As we’re all unique, one specific product rarely suits the needs of everyone. This is true when it comes to mobility vehicles as every person with a mobility issue has individual requirements and will need specific features to make them feel confident and comfortable when they drive. There are two main types of automotive adaptive controls, those that provide an external source of power to actuate existing vehicle controls and those that modify OEM components to alter the operation of vehicle control systems. Generally, these are referred to as servo-type motion control systems and reduced effort or zero effort control systems, respectively. Driver rehabilitation specialists perform comprehensive evaluations to identify the adaptive equipment most suited to your needs. They assess the type of seating needed and the person’s ability to exit and enter the vehicle. They provide advice on the purchase of modified vehicles and recommend appropriate wheelchair lifts or other equipment for a vehicle you own. 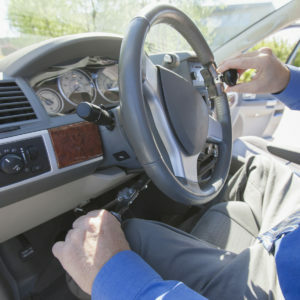 The use of wheelchair car and van hand controls usually requires the driver to take and pass a special training class which educates on the nuances of driving with the controls.